The Briarwood HOA website was developed to further enhance the HOA Board of Directors' and its Committees' communications with our residents and our community. Find userful community resources and provide feedback to the Board. Our next meeting is not listed in the database. Somebody please ask Jason to fix this issue. There have been recent car break-ins occurring in Briarwood. Please lock their car doors at all times and if you see something, be a good neighbor and report it to local Sherriff’s dept. The non-emergency number is 941-747-3011. We will be posting updates on our Briarwood facebook page as new features and content is added to this website so you'll know to come back and see what improvements we've made. Make sure you click Like from your facebook account and then also make sure you get notifications when Briarwood posts are made so you see them in your News Feed. If you hover over the Like Button again, a new menu appears. 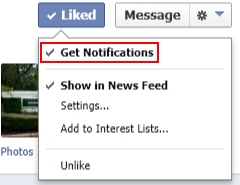 From that menu, click on the top option "Get Notifications" to turn on that feature.